First class on planes has always been luxurious and has gotten increasingly so (and increasingly expensive) over the years. 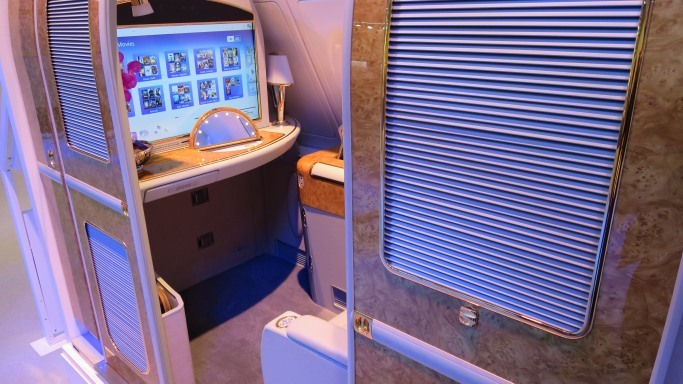 However, in spite of all these advances there still isn’t much that can compare in luxury, or cost with the ‘Suites’ class available with Singapore Airlines flights on the New York to Singapore route. Available since 2008 on their flagship Airbus A380 with tickets costing $18,400 USD it certainly isn’t a cheap way to fly, but what your money buys you can only be described as decadent. When you arrive at the airport in Singapore you will be taken to what is known as ‘The Private Room’, so exclusive that even 1st class passengers are not allowed to see the inside. Here you will be treated to as much gourmet food and as many premium drinks as you can stomach before boarding. It won’t be any ordinary boarding though as Suites passengers have their very own jet bridge allowing you onto to plane without any hassle so that you can enjoy the amenities on-board for as long as possible. Once on board the plane you will be taken to your suite which was designed by the French luxury yacht designer Jean-Jacques Coste and seated in a plush leather armchair which was hand-stitched by an Italian master craftsman. Once seated you will be brought champagne and a goodie bag to keep you interested as you wait for take-off. The goodie bag itself is a work of art and comes with a Salvatore Ferrragamo amenity kit with a full sized bottle of cologne. The headphones are made by Bose and everything else is from Givenchy, blankets, pillows, slippers pajamas, everything! Once you are settled you can enjoy their world class entertainment system which has a seemingly unlimited amount of movie choices, TV shows, music etc. After take-off the food and drink services starts up with gusto and you can chose from between premium drinks and world class cocktails, to gourmet teas and coffees. The dinner consists of a number of choices ranging from 5 to 7 courses. If that isn’t good enough for you then you can take advantage of Singapore Airlines’ ‘Book the Cook’ programme which allows you to choose what you want from an extensive list ahead of time. Once you are fed, watered and ready to relax for the night then the staff will come and turn your chair into a luxurious bed for you. There are no reclining half seats, half beds here! If you are travelling with someone or lucky enough to have the suite next to you empty, then the partitioning wall can be removed so that you can either have a double bed to yourself or share it with your partner. 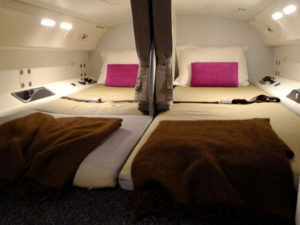 If there is enough free space on the Suites deck in that flight, you could even have a double bed each! The staff in the Suites cabin are extremely friendly and willing to do whatever it takes to give you the best flight experience possible. The flight from Singapore to New York has a stop-over in Frankfurt where guests of the Suites cabin can disembark the plane and recuperate from all that luxury in The Senator Room. Here they have access to hot showers and another gourmet restaurant, just in case the food provided by the plane wasn’t quite up to scratch. All in all, we believe that this is one of the most opulent and expensive flights available short of going private. The interesting thing is that this offer has been available for around 10 years now with only small changes. Given the recent advances in technology, we are excited to see what Singapore Airlines comes up with next when they decide the time for innovation and more decadence has arrived!